For me, it always starts with a salad. A hearty, healthy, nutritious, plant-based salad and today is no exception. 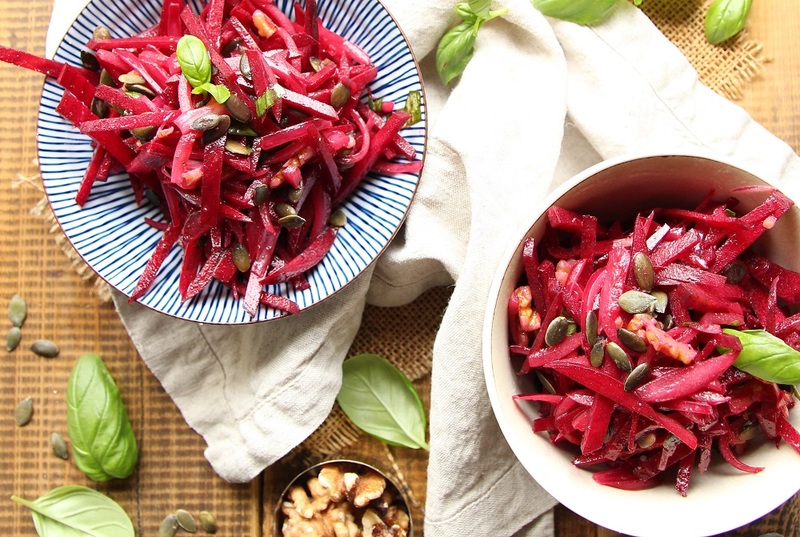 This raw vegan beetroot salad has it all. 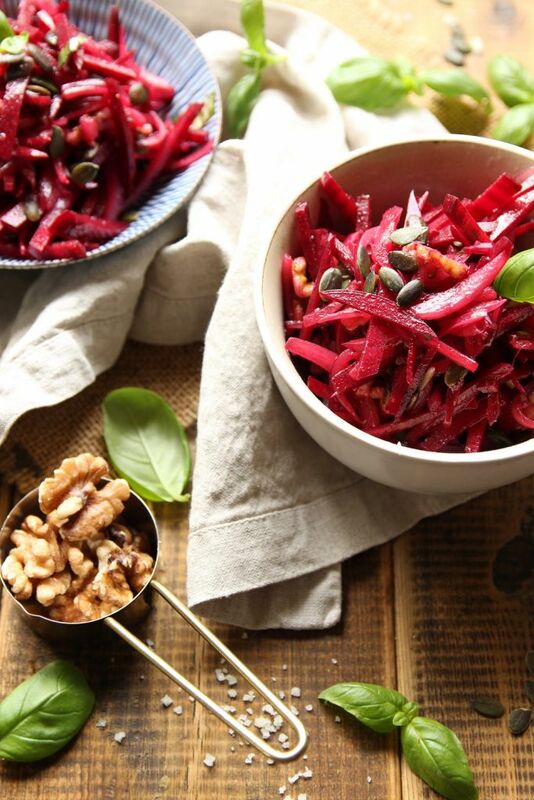 From its rustic look to the many different flavors and textures that perfectly complement one another, to the bright and radiant color of the raw beetroot. This raw vegan beetroot salad is one of my all-time favorites mainly because of the extra crunchy beetroot slices, and the slightly pickled red onion strips but also because this salad is literally goodness in a bowl! Starting from the fresh basil leaves, to the healthy pumpkin seeds and walnuts, to the drizzle of olive oil, and apple cider vinegar. Finally, this raw beet salad takes roughly 10 minutes to prepare, and requires just a few minimal ingredients, that you probably already have in your pantry. So, there you have it. Your meal will most probably continue onto the main dish and maybe even a dessert, if lucky, but it usually always starts off with a salad. Enjoy! 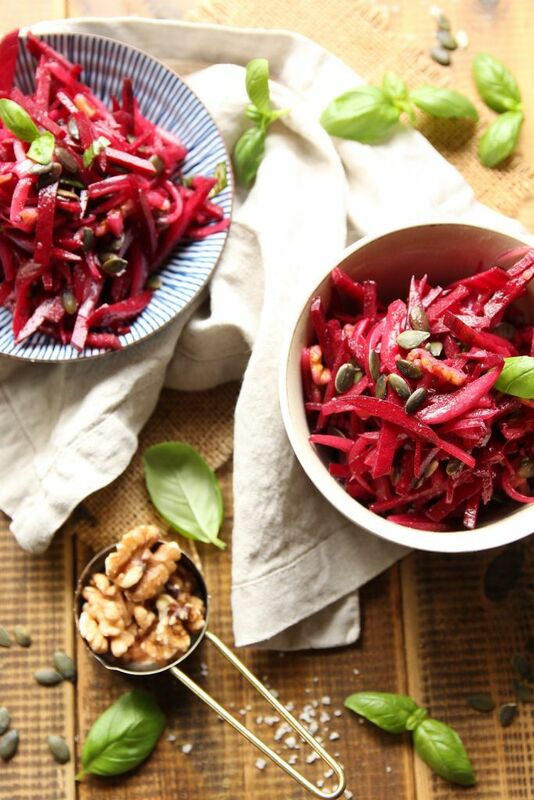 Raw Vegan Beetroot Salad In Under 10 Minutes! Peel and slice the red onion in half, then slice into long thin strips. Place into a bowl, add 1 teaspoon of sea salt, and 2 tablespoons of apple cider vinegar, and massage the onion slices for a couple of minutes, until they start to soften. Transfer into a serving bowl and set aside. Put on some gloves, then peel and finely slice the beetroot into long thin strips, the thinner the better, and add to the serving bowl. Roughly chop the fresh basil leaves, and add to the bowl along with the pumpkin seeds and crushed walnuts. Finally, add the olive oil and remaining 1/2 tablespoon of apple cider vinegar. Season with sea salt and black pepper to taste. Mix, taste and adjust seasoning if needed, and dig in! 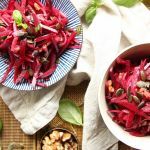 This Raw Vegan Beetroot Salad takes just 10 minutes to prepare, is packed with goodness, and perfect for a hot day! Peel and slice the red onion in half, then slice into long thin strips. 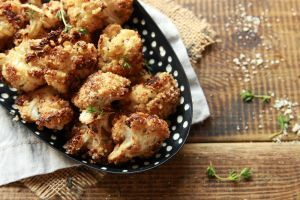 Place into a bowl, add 1 teaspoon of sea salt, and 2 tablespoons of apple cider vinegar, and massage the onion slices for a couple of minutes, until they start to soften. Transfer to serving bowl and set aside. Put on some gloves, then peel and finely slice the beetroot into long thin strips, the thinner the better, and add to the serving bowl. Roughly chop the fresh basil leaves, and add to the bowl along with the pumpkin seeds and crushed walnuts. Add the olive oil and remaining 1/2 tablespoon of apple cider vinegar. Season with sea salt and black pepper to taste. Mix, taste and adjust seasoning if needed, and dig in! 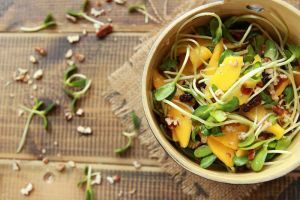 You can also pair your raw vegan beetroot salad with these Nutty Oven Roasted Cauliflower Florets, and this Refreshing Mango Salad, and you’ve got a delicious variety of entrees. ← Creamy Vegan Vegetable Soup With Chestnuts! I love beetroot! It is so delicious and healthy!